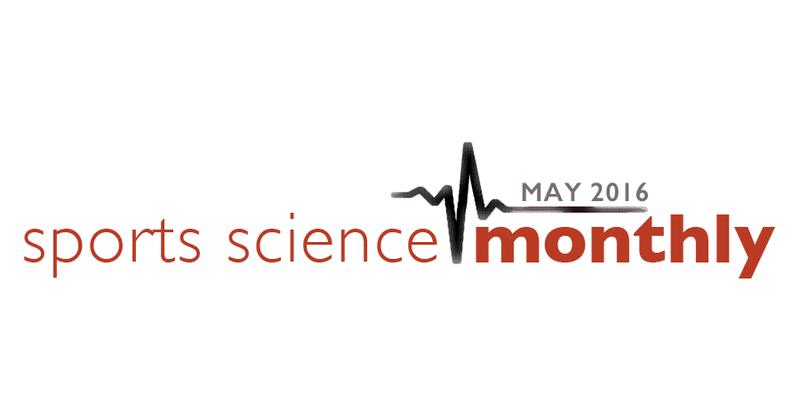 I started a new series last month called the Sports Science Monthly with the goal of translating the latest sports science research into information that coaches can use. In this month’s edition we take a look at five new topics ranging from sled pulls to sleep patterns. The full Sports Science Monthly is available exclusively to HMMR Plus Members, however we have included the first overview free to everyone below. Sign up now to read about all the research. To get an idea of what Sports Science Monthly is all about, our April 2016 edition is available in its entirety for free. → Related Content: Want to learn more? Check out last month’s issue of Sports Science Monthly. Last month we looked at the effect of different attachment points for the harness on sled pulls in sprint training. This month, we are going to look at a review of the use of sled pulling in sprint training. Review articles are useful because they look at all the research in a specific field, and then pull together the results to (hopefully) give us a sense of the current state of knowledge in this area. Sled pulling is an interesting training modality, especially in sprinting. Some coaches like to use them a lot, and I have seen videos of world class sprinters using very heavy loads in their sled drags. Other coaches believe that too much load alters sprint mechanics too much, so that the transfer of training isn’t particularly good – and may also result in changes in sprint mechanics. I have utilised a wide range of resisted sprints/sled pulls in my own training. Earlier in my career, I would do 30-meter sprints using weights ranging from 7 kilograms (less than 10% body weight) to 30 kilograms (over 33% body weight). In my last few years of sprinting, when I was based in Loughborough, I had access to a machine that could ensure uniform resistance throughout the whole sprint distance, which was incredibly useful. Typically, I would use this with a fairly light resistance, so that my sprint action mimicked my normal sprint technique as much as possible. As I then transitioned into bobsleigh, the demands of my sport changed slightly, and so I utilised much heavier resisted sprinting activities, with as much as 70% of my bodyweight in terms of weighted used. There is a fair amount of research in this area. In 2010, Clark et al. published the results of a seven week training intervention in collegiate lacrosse players, who either did un-resisted sprints, sprints using a weighted sled, or sprints using a weighted vest. Their findings indicated that the use of resisted sprints, either through a sled or weighted vest, were not beneficial, and potentially harmful to sprint performance. Note, however, that these subjects were lacrosse players, and not sprinters. A 2003 paper from Lockie et al., again in field sport athletes and not sprinters, found that sled pulling changed acceleration kinematics – stride length and stride frequency decreased, and contact time increased. They found that this effect was greater with heavier weights, so based on this we might caution that lighter weights might be more effective, or at least less likely to alter running mechanics. Other papers have found that when resistance is greater than 30% body weight, increases in ground reaction force are much higher – and we might be able to speculate that this could be a useful training intervention to make with sprinters, especially early on in the specific training phase. Due to the difference in findings from the research, this recent review article could well be useful. Entitled Resisted Sled Sprint Training To Improve Sprint Performance: A Systematic Review (Petrakos et al. 2015), it was published this month in Sports Medicine. The authors required studies to fulfil 4 key criteria for inclusion within this review. Firstly, they had to have used a sled for the resisted sprint training. Secondly, the resisted sled sprints had to be the primary training intervention. Thirdly, there had to be a comparison group, and importantly this had to be from the same population pool as the intervention group. This means that if you were studying sprinters doing sled pulls, the control group also had to be sprinters doing standard training, not rugby players for example. Finally, all studies had to be peer reviewed. After finding an initial 145 papers, once these criteria were applied and duplications removed, the authors were left with 11 papers. The authors then defined acceleration as 0-20 meters, and maximal velocity as more than 20 meters. This was important because different studies use different definitions, and had this not been done the researchers might have been comparing the results of a study defining acceleration as 0-50 meters with the results of a study defining max velocity as occurring after 10 meters. One thing that came out of the results was that there were three different techniques used to prescribe training load across all the papers. The most common was a load prescribed to produce a set reduction in velocity. For example, if I typically can accelerate to 20 meters from standing in 2 seconds, when using a sled my target might be to reach 20 meters in 2.5 seconds. I would then have to run a variety of sprint reps with different weights to see which weight allowed this reduction to occur. The next most popular was a load based on percentage of body mass, such as 30% body mass/weight. Finally, one study used absolute load, which in that particular case was 5 kilograms. Hopefully you can see how this technique might create erroneous results – 5 kilograms for a 50 kilograms athlete is likely to cause greater changes than 5 kilograms for a 100 kilograms athlete. As a quick aside, it turns out that a resistance equivalent to 10-13% body mass leads to about a 10% reduction in velocity. In athletes whom had already undergone some sprint or strength training, resisted sled sprint training at a load sufficient to reduce velocity by 7.5% had a moderate effect for improving velocity between 15-30 meters. Only a small effect was observed on maximum velocity. With heavier loads equivalent to around 13% of body mass, there were significant improvements in times over 0-5 meters, 0-10 meters, and 0-30 meters. Improvements were also seen in maximal sprint velocity, but these improvements were not significant. The researchers stated they were meaningful changes in practice though, which was good to see – quite often we rely on statistical significance in research, when actually the “real-world” effect is much more important. In team sport athletes, use of a load of around 13% body mass was also seen to improve acceleration speed. So, basically, resisted sprint training can improve sprint performance. So far, so good. But what happens when you compare those doing resisted sled training to those just doing normal (un-resisted) sprint training? The authors summarised that resisted sled sprint training was no more effective in improving acceleration or maximum velocity compared to un-resisted sprint training. One problem pointed out by the authors is that there is no research comparing the use of heavy sled loads and un-resisted sprint training. They also speculated that a mix of resisted sprint training, un-resisted sprint training, and plyometric training may be the ideal combination of training – much like that which is seen in the real world. In field-sport athletes, very heavy sled loads create greater improvements in acceleration than medium loads. There is no research examining this in sprint trained athletes, unfortunately. Resisted sled sprint training with loads up to 43% body mass are not detrimental to acceleration or maximum velocity. For non-sprint trained athletes, resisted sled sprint training with both light and heavy loads is likely to effectively improve acceleration – however un-resisted sprint training appears to be equally as effective. Heavy loads are more likely to positively affect initial acceleration. Medium loads are more likely to improve maximum velocity. What does this mean for a sprint coach? It means that there isn’t a requirement to use sled pulls in your training, particularly with beginners. However, sled pulls could well have a place in a training programme, especially if un-resisted sprint training is utilised properly. In the real world, most coaches won’t rely heavily on sled pulls, and the data from this review seems to support this. They can have a useful part in training, but if you want to get better at sprinting you have to sprint.